South Korean model Soo Joo Park, after A Show, Lincoln Centre, NYC, February 2014. Nicole Warne of Gary Pepper Girl,after Tory Burch, NYC, February 2014. Creative Consultant Kate Foley, after Prabal Gurung (I think! ), NYC, February 2014. Susie Lau of Style Bubble, Lincoln Centre, NYC, February 2014. Russian model Vasilisa Pavlova, after Lacoste, NYC, February 2014. A chic puffer jacket for apres polar vortex? yes please! 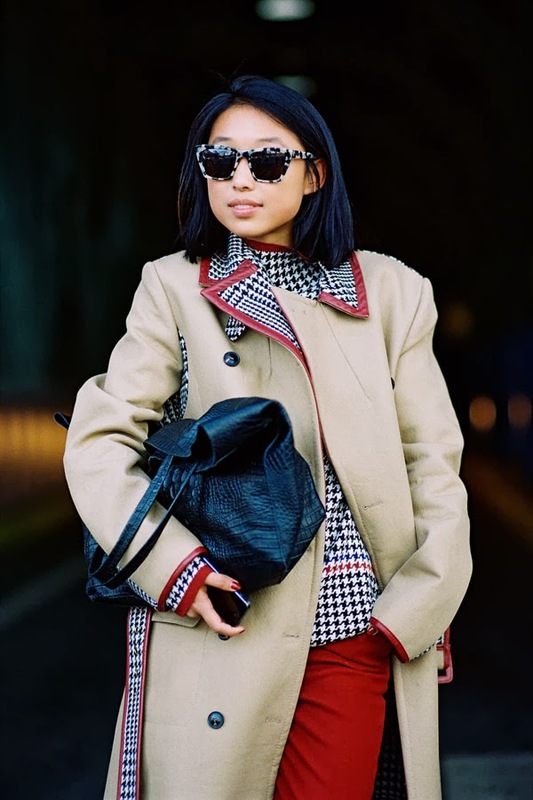 Margaret Zhang of Shine by Three, after Karen Walker, NYC, February 2014. DJ Leigh Lezark, after Viktor & Rolf, Tuileries, Paris, September 2013. A shout-out to the white shirt dress for summer. Anouk (Nouk) Torsing, after Chloe, Paris, September 2013. Model and blogger Irene Kim, before 3.1 Phillip Lim, NYC, February 2014. Chinese model Tian Yi, after Dries Van Noten, Paris, September 2013. American model Samantha Gradoville, Lincoln Centre, NYC, February 2014. Want to wear a sheer maxi skirt but the weather is still too cold? layer over jeans or tights and team with boots like Samantha has. French model Ophelie Guillermand, after Chloe, Paris, September 2013. Fashion writer, stylist and presenter Natalie Cantell, After Karen Walker, NYC, February 2014. Buro 24/7's Miroslava Duma, Lincoln Centre, NYC, February 2014. Such a chic way to protect your ears and neck from the cold (although probably only doable in subzero temps if you have a car and driver! ), and a lovely way to add a splash of colour to a netural outfit. 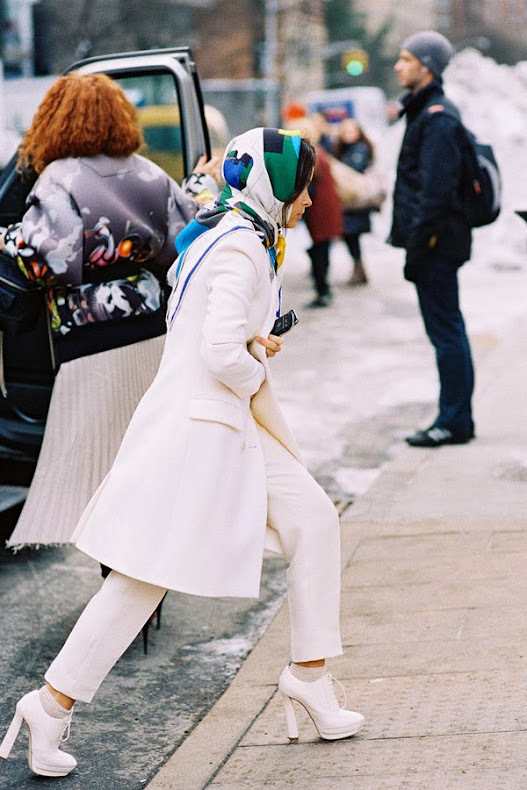 Another chic Miroslava headscarf moment (back in March 2013). Russian model Katya Riabinkina, after Zadig &Voltaire, Paris, October 2013. Before Rodarte, NYC, September 2013. Editor-in-Chief Lucky magazine, Eva Chen, Lincoln Centre, NYC, February 2014. Argentine model Magda Laguinge, after A Show, Paris, October 2013. Australian model Jessica Hart, after Sass & Bide, NYC, September 2013. So many fun polka dot pieces around this season....some subtle and some extremely bold. Combine with stripes like Jessica for print-on-print impact. Net-a-Porter Fashion Director Holli Rogers, before A Show, Paris, September 2013. Fabulous (and the same excellent red sandals - I think - that Margaret was wearing here). South Korean model Sung Hee Kim, after Chanel, Paris, March 2013. Stripes + polka dots = yes please.